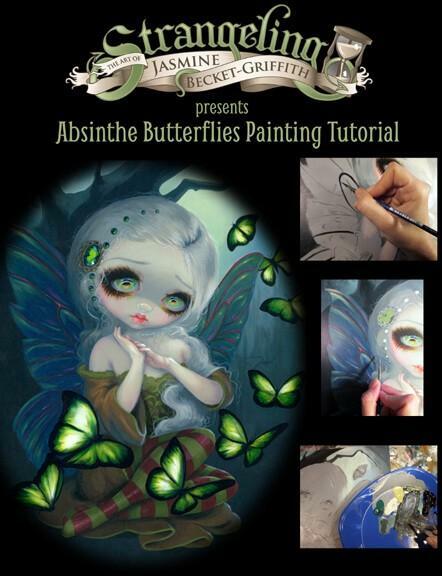 A wonderful e-Book in PDF format consisting of a tutorial following the step-by-step creation of “Absinthe Butterflies” by Jasmine Becket-Griffith. From bare wood panel to finished painting – illustrated with over 80 full colour photographs and detailed instructions from Jasmine. Sketching, composition, colour choices, and other insights into the creation of this artist. While this book focuses on this particular acrylic painting, it may also be helpful to artists working in other genres and other media, and is an enjoyable read for all Jasmine Becket-Griffith fans & collectors. PLEASE NOTE: Elements of this tutorial were previously published in the Italian cake decorating book “Molly and Jasmine” – if you already have read “Molly and Jasmine” this tutorial may be redundant.